Every July we pack up our tent and supplies and head off on an adventure. Our destination? A field in Tipperary that for a couple of weeks each year becomes a magical village; a village overflowing with singing and dancing, with healing and laughter, with a spirit that grows minute by minute and day by day. It’s an experience that is hard to put into words but so special that each year my kids are counting down the days like waiting for Christmas! Above all, Earthsong is an experience of community. We cook and eat together, we make music together, we learn new skills together, and we share the ups and downs of camping on a very well kitted-out site. Camping is in circles of 20-25 people with a mix of families, singles, and young and old. It always amazes me how deeply the circles bond, often with deep friendships formed. Each circle looks after its own domestic set up with makeshift kitchens around an open fire, so I always take warm clothes for late night chats and sing songs, and lots of marshmallows for toasting! Everyone takes it in turns to cook dinner, usually in pairs, so you only cook once and then are served scrumptious meals every evening after. It’s incredible the gorgeous stews and fabulous deserts that are rustled up. If you’re new to camping, fear not, there is always an experienced earthsonger on hand to help. One nice thing is we aren’t disturbed by a mobile phone going off during dinner because mobiles are for use off site only and this is a tremendous relief. One of the most refreshing things about Earthsong is that we get a chance to take time out from normal everyday stress or worries to relax and just “be”. Alcohol and drugs are also a no no on site, which increases our safety and sensitivity with those around us. It allows us to connect in more meaningful ways. There are so many fun things to do. There is a shop, a café, a children’s play area and peaceful woodland walks. Whether you are feeling quiet, sociable or wildly playful there is always something cool going on. 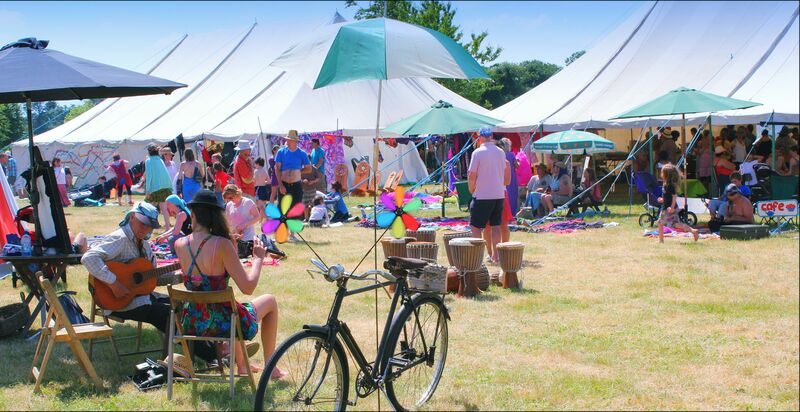 Moreover, there is an incredible choice of workshops to go to, from Sound Healing to Aikido, Georgian singing to African dance, as well as Cuban drumming, yurt making, tai chi, yoga and loads more, all facilitated by top notch leaders. Evening time at Earthsong is especially thrilling. 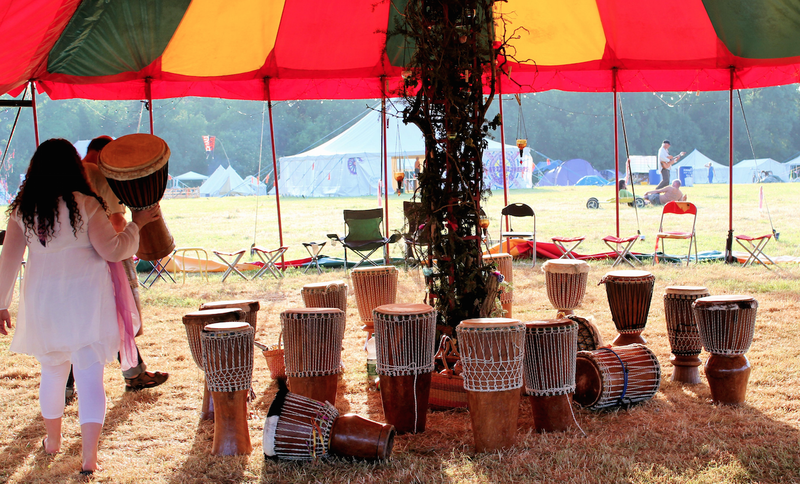 It might include rainforest songs in the moonlit woods, fiery big top drumming, children’s cabaret with hot chocolate or a stroll through the camp to visit new friends. It might take in an impromptu sing song or a game of volleyball. Sometimes, I have found myself luxuriating in the Yurt Sauna or eating too much chocolate and telling stories with friends. Of course for grownups to be happy it’s important that the children are happy too, so as a parent I really appreciate that there is a wonderfully diverse and wholesome children’s program which includes arts and crafts, sports, puppetry, drama and lots of other fun activities. 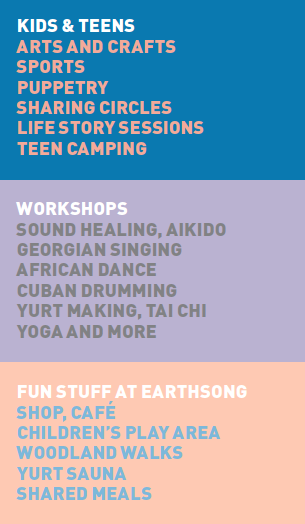 The ‘tweens’, (11-12) do a fantastic array of workshops and there is also a separate area for teens. Teenagers over 14 may camp together, supervised by the energetic teen team, whose duties include facilitating sharing circles and making hot chocolate for the evening life story sessions. For teenagers, Earthsong is a place that can transform their lives, a place where they can really be themselves and have an opportunity to share their experiences, to be heard, and to shine. The teens often offer so much inspiration to the camp as a whole, enriching us with their creativity, playfulness and boundless energy. It all adds up to a transformative experience. Earthsong has made a big difference in my own life and I also enjoy watching the joy it brings to those around me. I’ve brought a friend’s daughter for the past five years and I have loved watching her benefit and grow in so many ways. 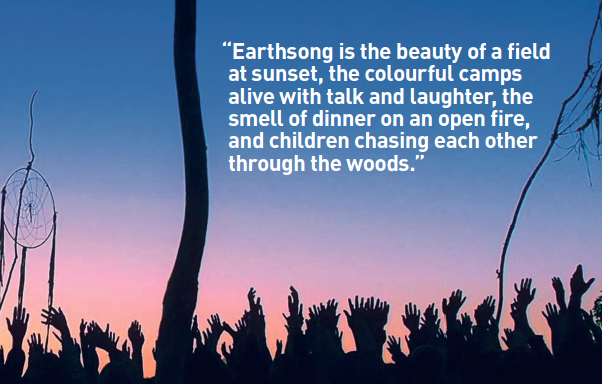 Earthsong is the beauty of a field at sunset, the colourful camps alive with talk and laughter, the smell of dinner on an open fire, and children chasing each other through the woods. It’s a guitar riff floating over from the teenager’s campfire, the unexpected kindnesses, and the joy of drinking tea under the stars with friends. Of course there are challenges and struggles, for this is a slice of real life, but I have experienced such harmony here. Earthsong is a community attempting to create something special and actually doing it. If you’re in two minds about coming to Earthsong then just throw caution to the wind; jump on board for the ride of your life.